My crochet hook sit's in my basket with a piece that has been on the go for more than a week. It's a piece of work that should only take a couple of hours to make, yet it is still there. So why is it not finished? Well we've made up our minds to sell our home and move to a bushy coastal area in which we can set up for our retirement later on. It won't be too far away from any of our children or to the hustle and bustle of the busy city's, just far enough to get away for a quiet retreat. I've been on the go giving the house a spit and polish from top to bottom. I have also de cluttered every room except for where I keep my crochet supplies and yarn. 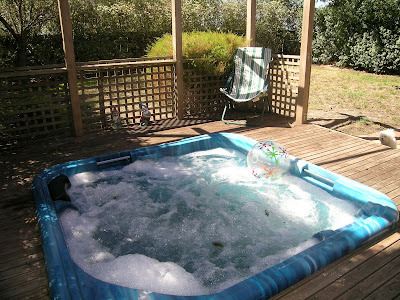 Below are some picture's that the real estate agent took for advertising our property. 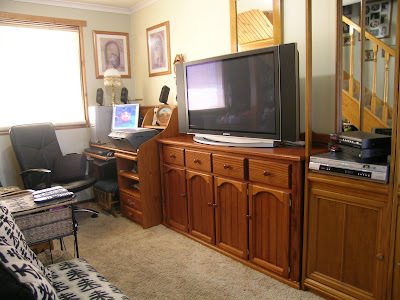 Not one of the picture's show any sign of my crochet, but if you look through the TV in the 1st photo, you can see the reflection of where I keep my yarn stacked up against the wall behind my chair. 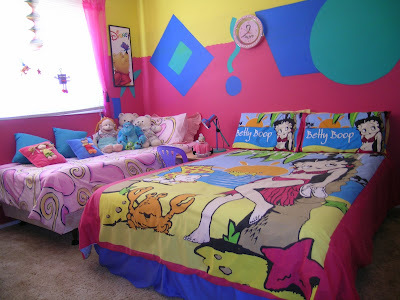 This is a room I made up for my grand kids when they come for sleep overs or just to play in. This picture was used for advertising and you can just see little Rev, peeking over the decking. 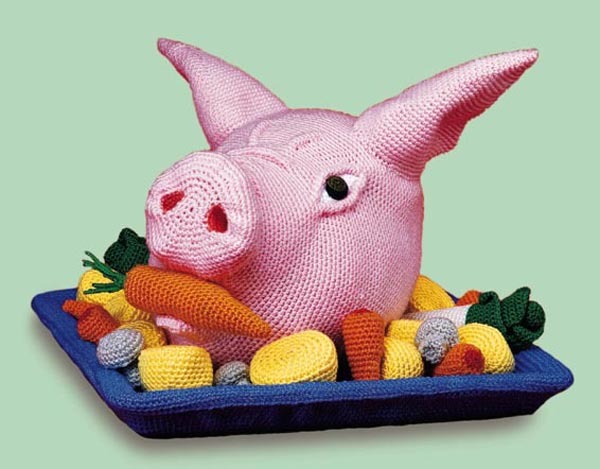 How Would You Teach A Person To Crochet? My eldest niece Roslyn came for a long week-end visit. She is from Queensland a good 2 and a half hour plane trip away. 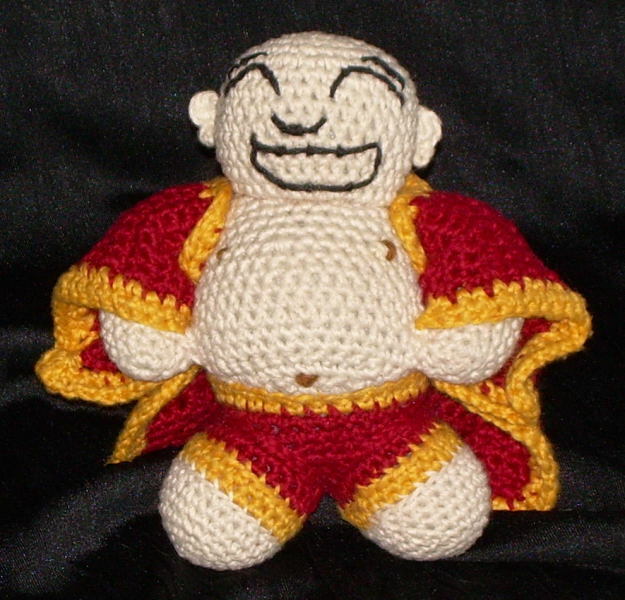 Teach me to crochet Aunty? she asked. Well okay I said. So how does one begin to teach another to crochet? Firstly I showed her how to make a slip knot onto the hook and demonstrated how it pulled apart with out knotting, easy part. 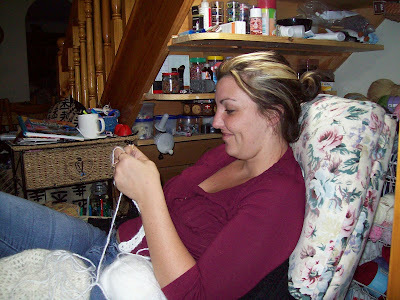 I then showed her how to hold her hook and the yarn and expressed how each person finds their own comfort eventually. Next it was making chains, lots of chains until she felt a little more comfortable. Then I pulled it all un done and said let's try a chain of 10 and an extra chain for a turning chain, as we are now going to learn how to make a sc into the chain. Now the chain of 10 plus 1 more chain for turning was easy for her. In through the 2nd chain from the hook and draw through a loop, yarn over and draw through 2 loops, we repeated this to the end. Ch 1 to turn, now make a sc in the first sc and in each sc across, good, she had the hang of it. So once again I rip it out and ask her to make it all by her self. 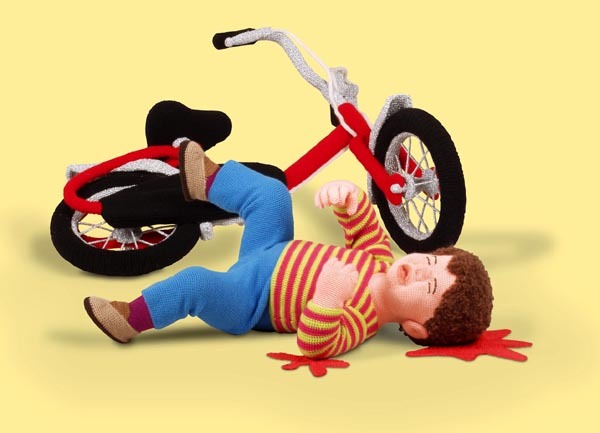 Rip it, rip it, rip it, I said, sounds like a frog and that's why it's known as frogging it. So she is learning some crochet slang too! Once she was confortable with the sc (by the way she was a fast learner, which made it quite easy for me to teach her) I asked her if she wanted to learn a dc and she said she was ready. I also told her I was using US crochet terms as they are more popular. We kept the same piece of work going and I told her to ch 3 to turn, but not to go into the first sc, but into the next sc, as the ch 3 to turn will now become her first st of the row. Once again she picked this up quick and with comfort. Do you want to make a scarf? Oh yes, she said. So I chose some yarn similar to a beret I had given her and she began making her own scarf. Her she is, in MY chair having fun with her new found hobby. This is the first row of her scarf. I asked her to count her dc's every now and again, some time's she had extra but mostly she had less. So a quick lesson of an increase or decrease was necessary. The missing dc's were from the beginning of her row's. So that was soon sorted. Now shortly after her lesson she had to catch a plane to return home to QLD, so I loaded her up with some nice plastic hooks that she could use on the plane, the steel one's would have been conviscated as a lethal weapon. I had the time to teach her to crochet in a circle too. She was also thinking of making her self a blanket/aghan, but I did not have the time to teach her how to make a granny square and I advised her to youtube it for visual lessons and she did! I turned around and here she was on the computer, yelling out "this lady is too fast", "well pause it" I said "or find a better one to learn from" and she did. So Roslyn has gone home with a new hobby. My Toilet Paper Roll Holder. 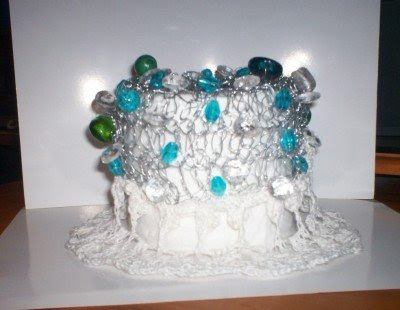 I wanted a unique and original toilet paper roll holder for my entry in the Toilet Paper Roll Design competition with in the Crochet Lovers Victoria competition. 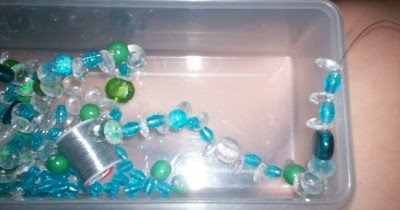 I had wire and beads in mind from the very beginning. First of all I collected the medium that I needed. I pre strung the wire with the beads. 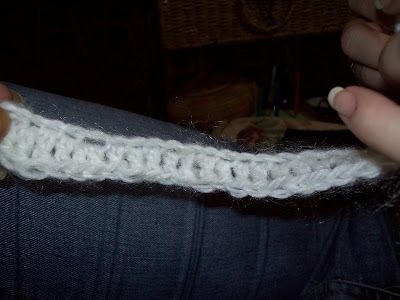 Then I began to crochet away, beginning with a chained circle and increasing for 3 rows only. I noticed that this wire was very hard to crochet with and it was scratching up my good no 6 hook. I have crocheted with wire before and I do not remember it being this hard before. I eventually changed to another no 6 hook and kept going on for the outer side of the holder. 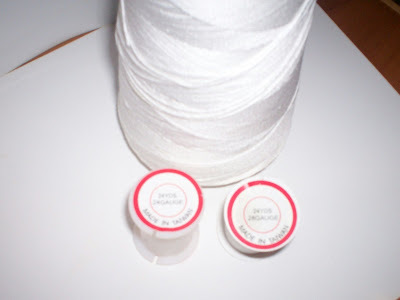 I eventually ran out of one whole spool of wire, but I knew I had back up from another spool of wire. It was not until I used the back up spool that I realized the wire was a thinner gauge. 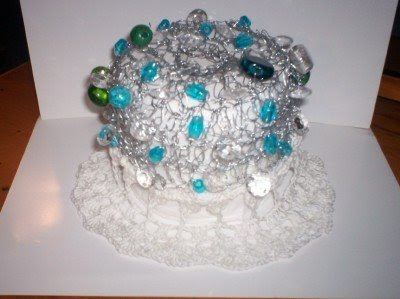 I had been crocheting with 24 gauge wire, I usually crochet with 28 gauge wire and it is much easier on the hands and the hook! Now I had used that spool of wire too. I had no more back up on hand. 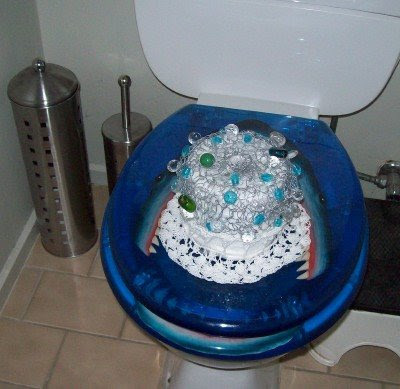 So I just sat the unfinished wire toilet paper cover on the toilet roll, whilst I thought about my next move. 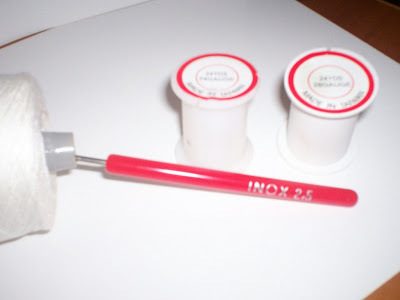 Wait and buy more wire, I couldn’t even remember where I had bought it in the first place, or try another medium. Oh yeah sure what could possibly look good with the wire? Brain storm, try this. Crochet a lacey bottom. 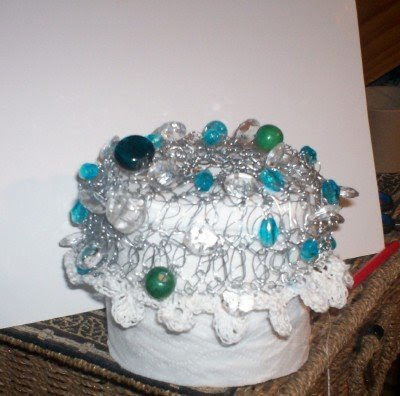 With a no 2.5 hook and some fine crochet cotton I made up the design as I went around the out sides. As it started to take form, I got more and more excited, “this is going to work I thought”. But my job was not over as I finished my final round. I must stiffen this lace for it to stay in place for ever. 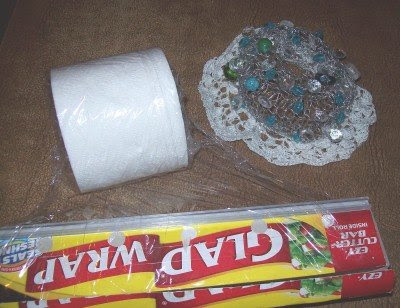 I wanted the perfect shape, but I knew the glue would stick to the toilet paper roll. So I wrapped the toilet paper roll in glad wrap to prevent this from happening. 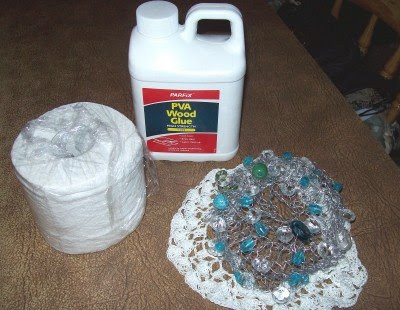 Using a mixture of both PVA glue and water slightly heated, I dipped the lace into the mixture and shaped it around the paper roll. 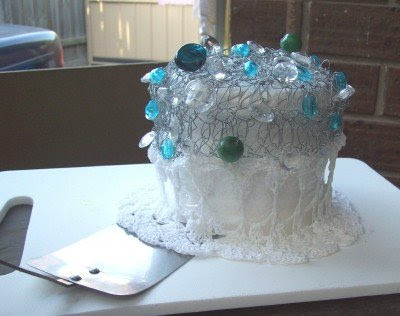 My next step was to sit back and wait for the lace to dry out and hope that it will hold up the wire and beaded top part. I would venture out side now and then with an egg flip to make sure the cotton was not adhering to the plastic board. Finally I knew the cotton crocheted part was dry enough, due to the extreme hot weather we have been having. So I removed it from the toilet paper roll and it was upright and sturdy. Yay! Sharkey the toilet lid cover was now going to have a new friend. 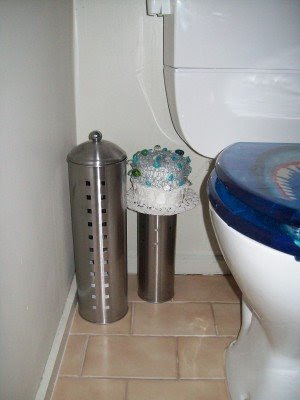 But I really wanted this to match the large toilet paper roll holder and the toilet brush, which is a steel look. I think it is actually too delicate for this toilet and I know my sister-in-laws bathroom in her holiday house is decked out in all of these colours. So guess where it is headed? Off to Phillip Island where it will truly blend in and show off its unique individuality. 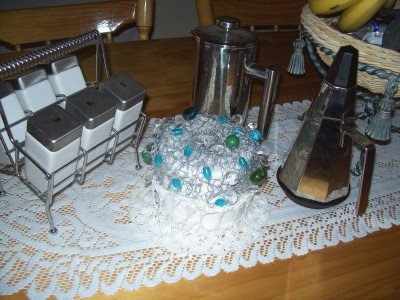 Oh boy it looks good on my kitchen table with all of my stainless steel. But I do not think that is really an option, do you? 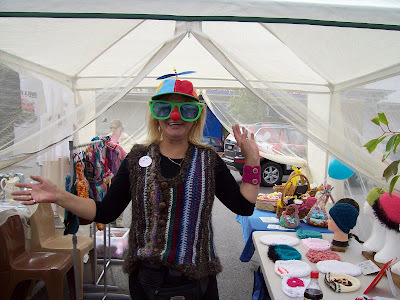 I rocked up just prior to 8.00 am and set up next to the sausage sizzle man, he is to the left of the table in the picture below. 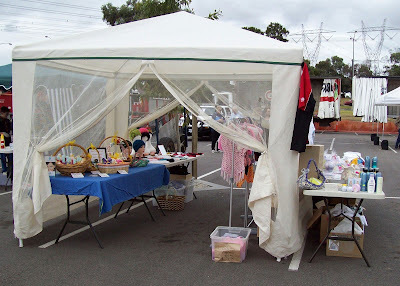 I was then provided with a marquee, which looked more like a mosquito net and I also set up and sold the items that are on the table out side to the right of my tent. Those items were all donated for the day and I did a pretty good trade on those as I set bargain prices. Better to be sold than not, was my motto on the day. 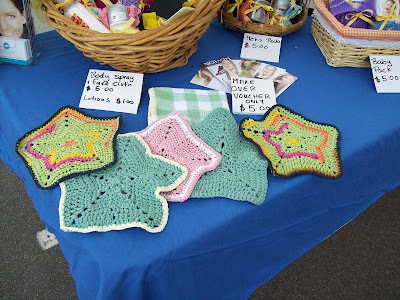 The star dish cloths were made by Shilo from Ravelry. Shilo also made many more things for the day and she even came along to help for a while. I must thank Shilo's husband for bringing her there, Shilo's daughter for being such a sweety and Shilo for helping out. So a big thank you, to the Shilo family. Oh now who do you think this clown is? Nah, I wouldn't be caught dead in that get up! But hey, anything to drag extra business in was well worth it. Now this little fellow is my grandson Braydn. 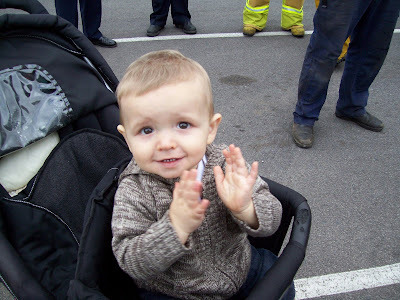 He came along to see the fire trucks and fast cars. And this is Bradyn's brother Cooper, who got to go in the fire truck and the lovely girl next to him, is my number 3 daughter who assisted to get the fund raiser off and running. 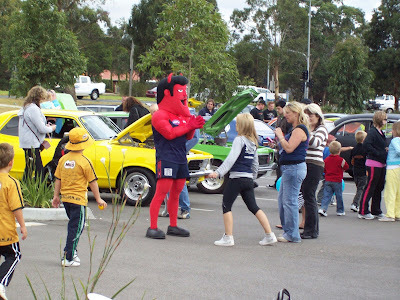 For you footy fans, here is the Melbourne Demons Mascot, near some very nice hotted up cars. 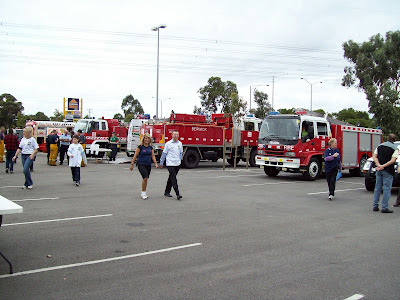 There was plenty of fire trucks on board for the day, but sadly 2 of them were called out, to yet another fire. 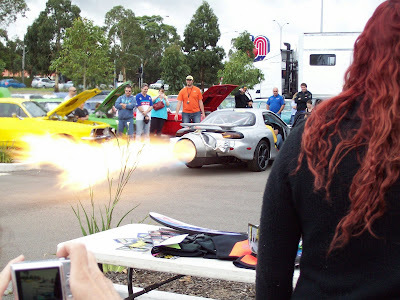 Now this was a real thrill, a jet engine vehicle. I have never seen one before and I was not aware of what happens when they start up. But I soon found out and jumped 10 foot into the air! I was able to snap this awesome picture of the flames ripping out of the jet. I'd love to have one of those for heating on a cold night, but not the noise along with it. My hubby was at home and he said our windows shook, he thought it may have been another earth tremor as we had a real one the night before. 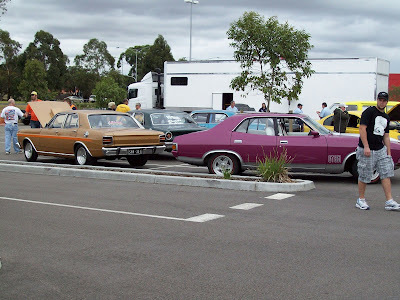 Just some more hotted up cars. Boys and their toys. Well the day was it self was enjoyable, a band played some toe tapping songs. There was plenty of activity happening around to just sit back and take in. 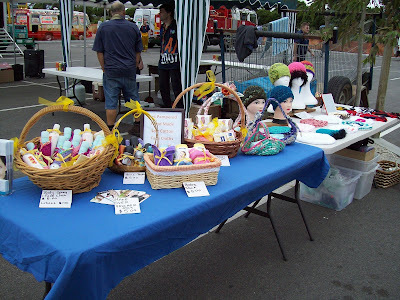 And between the 2 stalls I ended up with a grand total of $400 for the day! I was very pleased and it was a pleasure to be able to pitch in and help raise the money for the day. 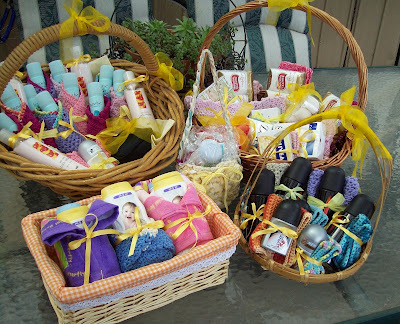 I do have left over stock that I will be taking to the Salvo's collection centre for the fire victims. I hope you have enjoyed my little adventure here. This is what the relief packages look like now. The yellow ribbon that all the parcels are wrapped in, represent the bush fire victims, just like a pink ribbon represents breast cancer. Below is a group shot. 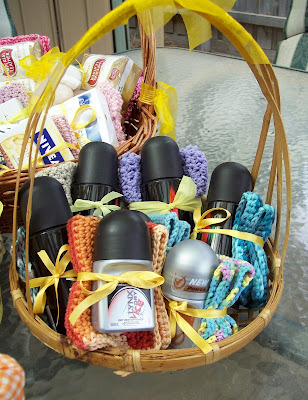 Feminine scent's, moisturiser and deodorant wrapped in a lovely soft cotton face cloth. 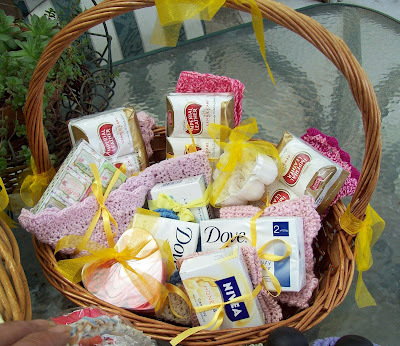 Luxury soaps, again wrapped in a lovely soft cotton face cloth. Deodorant's for the men too. 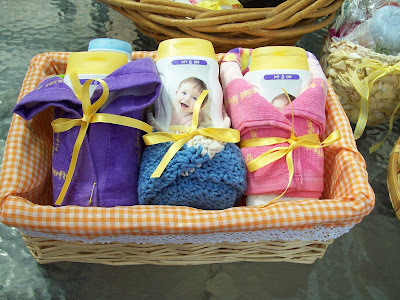 And a little bit for baby, baby powder and nappy change lotion packs. I just may be able to source some more goodies before they are sent off. A special thank you to those who have helped me with supplies and the making of some cloths too. 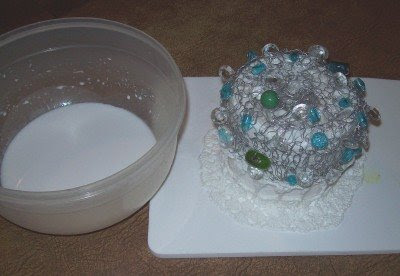 I was just surfing the net and did a google image search on "Sculpture Crochet" and here are some interesting picture's I came up with. Enjoy. Below is a lawn mower.